Ready to drink filtered water is a luxury you can afford to have at home. A great filter pitcher makes your water safe and gets the whole family to enjoy crisp, delicious water. A water filter pitcher is a small and simple filtration unit that is made up of a reservoir and filter cartridge. Unfiltered water is purified as it flows through the cartridge filters and into the jug reservoir. The filter is usually made of Granulated Activated Charcoal filament to remove toxins for example, chlorine and heavy metals. How Does A Water Filter Pitcher Work? Filter pitchers are made to stay in the refrigerator, a countertop or shelf. Though the size and design of different filter pitchers may vary, they work under the same principle. Most water purifier pitchers have a replaceable filter that is made from activated carbon. The activated carbon filter is made from coconut shells that are heat-treated in an inert atmosphere through chemical activation. It acts as an absorbent that eliminates organic pollutants such as chlorine and reduces levels of other contaminants like zinc and copper. Water filter pitchers force water from an upper reservoir through the filter filaments and into a lower storage tank by gravity. In commercial grade water pitchers, activated carbon filters are used in combination with polymer resin to remove more contaminants through an ion exchange process. This works more efficiently as more pollutants are removed from your water. Below are careful review of some of the best water filter pitchers available in the market as per features and functionality. Who Will Need A Water Filter Pitcher? There are lots of reasons to have a water filter pitcher at home. Tap water travels so far from its source and easily gets contaminated along the way with sediment, rust, heavy metals and other toxins. Water filter pitchers are the least expensive way to remove contaminants and guarantee clean and pure water. They remove a range of toxins and some are specially designed to remove fluoride. They are also small and compact in size, making them ideal for small spaces and mini-fridges. A water filter pitcher provides an easy and fast access to water for anyone who may not need large, sophisticated filtration systems. Alkaline and ionizer pitchers not only remove harmful contaminants from water but also increase the pH level of water. Alkaline water improves body hydration and the taste of water when drinking or making beverages. The EHM ULTRA alkaline water pitcher is a great solution for clean and pure drinking water at home. It turns contaminated water with impurities such as chlorine, heavy metals and other potentially harmful toxins into fresh and crisp drinking water. This water filter is really easy to set up with no installation needed. Simply fill the jar with water, give it a few minutes to work and voila, you have pure mineralized water that not only tastes better but also has health benefits. The EHM water filter pitcher turn minerals found in your water into hydrate minerals that are easier to absorb by the body. After ionization, water contains very low levels of free radicals, is healthy for drinking and also has a high pH. This filter pitcher has a composite 6 stage filter cartridge that removes impurities from water and restores water to an alkaline pH of 9 or 10. It improves the quality of your water and lasts up to 2 months before it needs replacement. The EHM pitcher is made from BPA free plastic and is designed to fit in the fridge. Using a filter pitcher is cost effective and saves the planet of plastic waste from bottled water. Clean and safe water is important for good health. The Seychelle ph2O alkaline water filter ensures you have clean drinking water round the clock. It increases the water’s pH up to 9.5 which is healthy and easily absorbable, increasing your body hydration. Seychelle water filter eliminates bacteria and other contaminants such as heavy metals, organic compounds and chlorine. The filter cartridges can last up to three months of use, a long period compared to its small size. It comes with 1- and 2-liter capacity options and is designed to take minimal space in your fridge. It also improves the quality and taste of your beverages, a simple solution for people with really hard water. Reshape alkaline water pitcher has taken a new spin on the old pitcher designs. It is a commercial grade home pitcher that eliminates water toxins and leaves your regular tap water clean and pure in no time. It has an impressive 3.5L capacity and 2 replaceable filters that are detachable from the jug. The Reshape water filters are attached to the bottom of the reservoir so clean water does not mix with unfiltered water. They are certified to eliminate chlorine, fluoride, lead and volatile organic compounds through a four-stage filtration system. Additionally, it adds minerals to water and increases its pH so water stays soft but with added health benefits. It antioxidizes water by lowering its Oxidation Reduction Potential (ORP). Antioxidants have ant-aging properties and remove harmful positive free radicals from your body. Reshape water filter pitcher has unique black housing made from high-impact ABS plastic. It is easy to clean and can withstand daily use. The lid has a built-in digital timer that counts down days to your next filter replacement. This is an easy reminder and it usually lasts 60 to 75 days. Aozora Large water filter pitcher provides safe and reliable water for you and your family. It is made from sustainable and food-grade materials that last and do not leach chemical toxins in your water. Its advanced carbon filtration system removes 200% more water pollutants than other units of its kind. It is NSF 42 and 53 certified to reduce contaminants such as lead, chlorine and copper. Additionally, it uses UV light to purify water of bacteria and other micro-organisms that are harmful to your health. Aozora water filter pitcher holds 3.5 liters of water and has a filter lifespan of 150 gallons, longer than most pitchers available in the market. It retains trace amounts of beneficial minerals such as magnesium and calcium that improve health. It is easy to refill the Aozora Large water pitcher without removing the lid. All parts are detachable for easy cleaning and there is a power outlet that lets you charge the UV light. Fluoride is a common contaminant in water that was once thought useful. Over the years, fluoride has shown to have harmful effects when consumed over time and now there are filter pitchers specially made to remove fluoride. Get your family to hydrate more with the Aozora Large water filter feature that is made to provide easy access to clean and safe drinking water. It is made from 100% BPA free material that is safe and has an effective dual filtration system that removes impurities from tap water. The Aquagear fluoride water filter pitcher combines UV light and activated carbon purification systems. UV light kills pathogens such as bacteria and mold in your water and reduces the taste of chlorine. The activated carbon granules absorb contaminants such as fluoride, lead and mercury. This pitcher has an 18-cup capacity and the filters can produce 150 gallons of water each, enough to serve the average family’s daily needs. It has an ergonomic design to increase functionality while keeping it simple to use. Aquagear water filter pitcher has a 0.5 gallon per minute flow rate and can be refilled from the top without taking the lid off. It has detachable parts that are easy to clean and an anti-slip base so it can securely sit on any surface. It has a digital timer to keep track of your filter usage and the UV lighting can last more than a hundred charge cycles. Clearly Filtered have outdone themselves with a GEN 2 filter that is NSF 42,53,244,401 and 473 certified to remove water pollutants. It is a leading reliable brand in the market that offers a lifetime guaranteed customer support to replace your pitcher in case it ever breaks. The filter on this unit is proprietary to the brand and effectively removes fluoride, lead, pharmaceuticals and 230 other contaminants found in tap water. It improves the taste and smell of drinking water by removing more than 90% chlorine. It has a long filter lifespan of 100 gallons and made from food-grade materials that are environmentally friendly and BPA free. This means that it does not leach toxins into your water and is cost-efficient compared to plastic bottled water. Epic Pure water filter pitcher is a premium pitcher that combines several filtration technologies so it can eliminate up to 99% of water contaminants that are harmful to your health. It is a fluoride filter pitcher that works better than most brands available in the market. It has a 5-stage filter system with micron-pores which absorb fluoride and other dissolved solids in water. Each filter can produce 150 gallons of water while selectively ensuring beneficial minerals such as calcium and magnesium are retained for healthy and great tasting drinking water. Epic Pure has a good functional design that is easy to pour. It has a secure lid and a digital reminder for when you need to replace your filter. This pitcher not only saves you money but also improves your body’s hydration. It alkalinizes water so it is easily absorbed and helps keep your body pH balanced. Contaminated water is harmful when consumed over time and affects the taste water. The Brita 5-cup water filter pitcher is designed to fit just about anywhere. It is a small, plastic pitcher with advanced filtration technology to remove impurities such as heavy metals, chlorine and reduce copper in your water. The 5-cup pitcher by Brita is an affordable option when looking for accessible clean and safe water. It is small enough to fit in your fridge without taking much space and cost-efficient. One filter lasts 40 gallons of water, equivalent to 300 bottles of drinking water. The Brita filter performs well and lasts up to 2 months with an indicator that lets you know when to change your filters. The Brita 5-cup water filter pitcher has a flip top lid that is easy to refill and perfectly sized for carrying when travelling. Hard to separate the reservoir from the pitcher. PUR 5-Cup water filter pitcher is the first of its kind to remove 99% of microbial cysts from contaminated water. These are disease-causing, microorganisms that are harmful to our health. It has a well-fit filter so unfiltered water does not mix with clean water in the reservoir. It uses a combination of carbon materials and an ion exchange system to remove water pollutants such as chlorine, leaving your water with a fresh, crisp taste. It is certified to remove 95% of mercury and 96% of trace levels of pharmaceuticals usually found in tap water. The filters can produce 40 gallons of water before they need replacement. PUR 5-Cup water filter pitcher easily fits in your refrigerator and has a spout cover so no particulates drop into your water. The ZeroWater 10-cup filter pitcher is a simple way to access clean and great tasting water for daily use. It has lots of features that not only make it easier to use but it also only takes up a small footprint in your refrigerator. ZeroWater filter pitcher is NSF certified to remove 99.6% of Totally Dissolved Solids (TDS), two times more than all other leading brands. It has a five-stage filtration system that removes suspended solids as well as organic and inorganic compounds. It is certified to remove chlorine, lead, heavy metals and other contaminants by combining carbon filtration and ion exchange technology. It is a reliable option for safe drinking water and leaves water pure and safe for drinking. This pitcher is easy to use and made from high quality BPA free plastic. It does not seep toxins into your water and has a dispense spout designed to reduce spills while pouring water. The filter can last up to 6 months of use and the ZeroWater filter pitcher has an in-built TDS meter. It lets you monitor the purity of your water and keeps track of your filter replacement schedule. 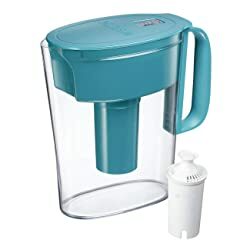 This is the largest capacity water filter pitcher by Brita, one of the best-known brands in water filtration solutions. It provides water for the whole family and has an ergonomic oval design that can fit in tights spaces in the fridge. The Brita Large 10-Cup pitcher is made with the user in in mind. The easy to grip handle has ridges so it does not slip or cause spills when pouring. It has an easy to remove lid for refilling and comes in an array of colors that go with modern kitchen décor. Even though this Brita pitcher has a large 10-cup capacity, it is lightweight and durable. It is made from BPA free plastic and only weighs 2.29 pounds. Brita filter pitcher is certified to reduce copper, mercury, zinc and other water contaminants. This not only improves the quality of tap water but also gives peace of mind that your family is safe from harmful substances in unfiltered water. It has an LED indicator that signals when it is time to replace your filter. This is usually after 2 months or after 40 gallons of water has been filtered. Filter easily detaches from pitcher when pouring. The Dafi water pitcher performs double duty as a filter and an alkaline pitcher. It is a great solution if you are concerned about water contaminants in your water and are looking for an easy solution. This unit is made with good quality materials and provides a reliable source of pure and healthy water. The Dafi Alkaline UP Crystal Pitcher improves the health benefits of regular tap water. It has a ceramic bed that contains magnesium, zinc oxide, calcium oxide and silica oxide. This adds minerals to your water that not only improves its pH but also its negative ORP potential. Alkaline water improves your body’s hydration for all body functions since it is highly absorbable. A high ORP means that water is rich in antioxidants which have anti-aging properties and help eliminated free positive radicals in the body. It eliminates heavy metals using ion exchangeable resin and removes other contaminants using a carbon filter block. The carbon filter increases the absorption surface area and gets rid of chlorine and its smell. This makes water safe for human consumption and enjoyable to drink. The Dafi Alkaline water filter pitcher can fill 8 cups of water and its filter is made from BPA free plastic. Its housing is made from superior quality glass that is shatter-proof and has high thermal shock resistance so it does not crack easy. One of the best features of this unit is that it comes with a phone app that reminds you when to change your filters. This can last up to 40 gallons of use before you need to buy a new filter. High pH and ORP levels. Made from great quality glass. Brita Medium Pitcher filter is a sturdy filtration unit made from stainless steel. It is built to last and has filter technology certified to remove five of the most common contaminants found in tap water. It has an 8-cup capacity and BPA free filter that reduces chlorine, zinc, copper, mercury and cadmium pollutants. It purifies water and improves taste by reducing chlorine that affects the smell and quality of water. It is a lightweight filter pitcher which only weighs 2.11 pounds and has a compact design that easily fits on a shelf or in the refrigerator. The LED light indicator on this unit changes color from green, yellow to red depending on your usage. This is an easy reminder when you need to replace your filter and not run out of clean, drinking water. The Brita stainless-steel filter pitcher is made from fingerprint-resistant material and has an easy to grip handle. The flip top lid is convenient when refilling and the filter can last up to 2 months of use. The above review focuses on top-performing water filter pitchers’ ability to purify water. Though they may seem similar in construction, their functionality will vary depending on a number of factors. Below are simple considerations to make to help you decide of an ideal filter pitcher that suits your home’s needs. The material of your water filter pitcher unit will affect its durability and weight. Most pitchers are made from plastic and are light. Ensure you buy one that is certified to be BPA free and safe for daily use. Glass filter pitchers do not leach any toxins to your water but are generally more expensive and fragile. A good water filter should last you at least two months before you need to replace it. You should also ensure you test your water so you buy a pitcher that is proven to remove contaminants specific to your water. There are filters that add minerals to water for better health benefits which is a bonus. To avoid running out of water unexpectedly, look for a convenient filter change indicator in the unit you wish to buy. The capacity of your water filter pitcher is determined by the number of people intending to use it and how much volume of water is filtered at a time. A large capacity water pitcher reduces the number of times you have to refill the pitcher at a time even when being used by a number of people. Compared to other types of water filters, water filter pitchers are really easy to use. However, they require regular cleaning and filter replacements. An easy to clean unit will save you time and also prevent growth of mould and algae. Filter replacements should be easy to replace, accessible and cheap to buy. Your budget should help you narrow down your options without compromising on the quality of the water filter pitcher. The cost of water filter pitchers varies according to features and brands so ensure to do your research so you find the best offer that matches your family’s needs. Whatever your water source, water filter pitchers provide a simple water purification solution for constant supply of delicious, healthy and pure water. The above article is a good tool to help you decide on a water pitcher that will work for you as per your situation and preference.